The next generation of surgeons can have a go at keyhole surgery with jelly organs at a special family event in Dundee this weekend (Saturday 11 March 2017). 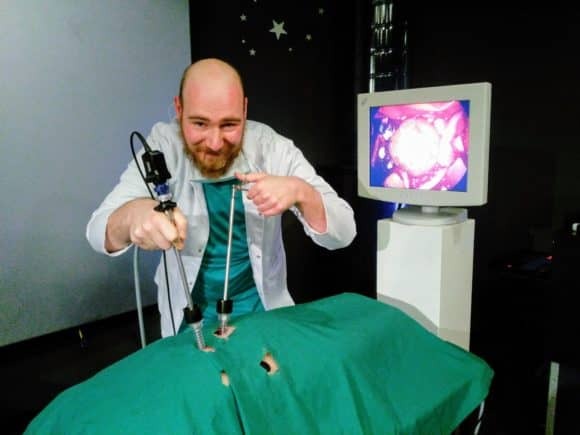 ‘Brilliant Body Bits’, part of British Science Week (10-19 March), will see Dundee Science Centre’s team demonstrating keyhole surgery using jelly organs and real-life equipment (camera and laparoscopic tools). Visitors will get the chance to have a go for themselves, and watch the action on a screen showing the fake torso’s insides. In what is the latest ‘Meet the Expert’ event, Dundee Science Centre is bringing together a host of local experts, giving visitors an insight into everything from our blood transport system and nutrition, to exercise. There will even be the chance to donate stem cells, and younger visitors (aged 4-7) can bring their teddy bear along to the Teddy Bear Hospital to discover what it’s like to be in hospital, and what’s inside our bodies. The event will run from 10am-4pm, and is included as part of normal admission. Experts attending include Henry Rae from the University of St Andrews who will be talking to people about the blood and heart transport system. He will be bringing along an ECG machine, heart models, a training defibrillator, a pacemaker, and some stethoscopes. The Dundee Medical Schools’ Teddy Bear Hospital will be delivering sessions on a range of topics between midday and 1pm – It’s An Emergency, Broken Bones, People Who Help Us, What a Doctor Uses, What’s Inside My Body and Healthy Eating. Sessions are aimed at P1-3 (4-7 year olds) and children are encouraged to bring their teddies. Anthony Nolan Trust will be providing information about stem cell and bone marrow transplants and why they are so important. Visitors who meet stem cell donation criteria (such as age and weight range) can donate a sample by spitting into a tube and being added to a register which matches potential donors with patients in critical need. University of Dundee School of Life Sciences will be bringing along their ‘Microbe Motels’. They will be translating the concept of the human gut microbiome by adding coloured liquids (to represent different bacteria) and food to a mock gut. The mixture is squeezed out of the gut as a ‘poo’. They’ll be talking about the importance of balanced gut microbiota and the impact on human health and wellbeing. There will also be hands-on exercise fun with the Institute of Sport and Exercise at the University of Dundee. The event is part of the annual celebration British Science Week (10-19 March) which is coordinated by the British Science Association (BSA) and funded by the Department for Business, Energy & Industrial Strategy (BEIS).